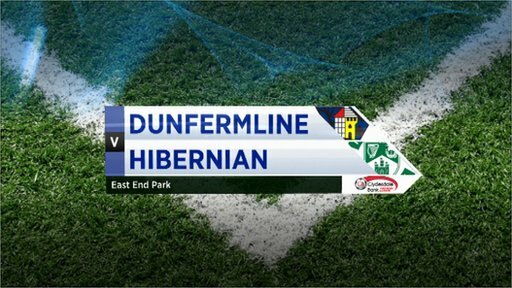 Dunfermline Athletic came from two goals behind to rescue a point in a thriller with bottom side Hibernian. Hibs took the lead against the run of play when Ivan Sproule fired into the corner after 37 minutes. Garry O'Connor's deflected drive increased the lead six minutes after the break, but Ryan Thomson rolled in a reply within 120 seconds. And Paul Hanlon deflected a Jason Thomson cross into his own net to complete the comeback 10 minutes later. Hibs survived late pressure to secure a second draw within seven days in the first Scottish Premier League meeting beside the sides since 2007 but remain at the foot of the table. Dunfermline, already denied the services of several midfielders through injury, were without recent signing Craig Easton, who picked up an injury making his debut in last weekend's 3-2 defeat away to Kilmarnock and was replaced with Ryan Thomson. Hibs were minus the experience of captain Ian Murray, who failed a late fitness test, and Callum Booth took his place in defence. The visitors, with Junior Agogo dropped to the bench in favour of Leigh Griffiths, were quickly in the ascendency, with the on-loan Wolves striker and Sproule firing wide. The Pars grew in confidence and Jason Thomson, Alex Keddie and Andy Kirk passed up chances. However, Hibs took the lead when Griffiths flicked on from a throw-in, Martin Scott's pass took a deflection into the path of Sproule and the Northern Ireland winger drove into the far corner. The game had swung back in Hibs' favour and, with the Pars were leaving spaces at the back as they sought an equaliser after the break, goalkeeper Paul Gallacher turned wide an O'Connor drive after the Scotland striker charged into the box. Griffiths' header was cleared off the line via the crossbar by Kirk and Gallacher blocked a shot from O'Connor on the rebound. O'Connor, who has had another week in the headlines for events in his private life, was not to be denied moments later when his 20-yard drive deflected off Keddie and out of the despairing Gallacher's reach. However, Dunfermline responded within seconds when Ryan Thomson made room for himself 20 yards out before rolling a reply into the far corner. Isaiah Osbourne forced another good save with a shot on the turn as Dunfermline continued to look uncomfortable at the back, while Pars substitute Andrew Barrowman headed over from six yards. Dunfermline were back on level terms when Jason Thomson pounced after goalkeeper Graham Stack could not hold an Austin McCann drive and the on-loan Hearts defender's cross-come-shot was deflected in by Hanlon. Barrowman headed just wide and Joe Cardle had a fine low drive blocked away by Stack as the Pars were denied their first home win of the season and only their third victory over Hibs in their last 13 league meetings. 90:00+3:41 The referee ends the match. 90:00+3:06 Centre by Joe Cardle, clearance by Callum Booth. Corner taken right-footed by Joe Cardle, Victor Palsson manages to make a clearance. 90:00+2:31 Unfair challenge on Joe Cardle by Martin Scott results in a free kick. Free kick taken by Austin McCann. 90:00+1:07 Martin Scott fouled by Austin McCann, the ref awards a free kick. Direct free kick taken by Graham Stack. 90:00+0:30 David Wotherspoon has an effort at goal from just inside the box that misses to the right of the target. 89:16 Outswinging corner taken right-footed by Joe Cardle, Paul Hanlon manages to make a clearance. 86:29 Paul Burns is flagged offside by the assistant referee. Graham Stack takes the free kick. 84:27 Callum Booth is penalised for a handball. Paul Gallacher restarts play with the free kick. 81:45 Joe Cardle takes a shot. Graham Stack makes a save. 80:06 Substitution David Wotherspoon joins the action as a substitute, replacing Ivan Sproule. 78:07 Jason Thomson crosses the ball, Header from close range by Andrew Barrowman misses to the right of the goal. 77:13 The offside flag is raised against Andrew Barrowman. Graham Stack takes the direct free kick. 75:58 Richie Towell has an effort from just inside the box that misses to the left of the goal. 73:04 Effort from outside the penalty box by Joe Cardle goes wide right of the goal. 72:30 Gary Mason takes the free kick. 72:30 Booking Sean O'Hanlon booked for unsporting behaviour. 72:26 Foul by Sean O'Hanlon on David Graham, free kick awarded. 71:46 Effort from 25 yards by Joe Cardle. Graham Stack makes a comfortable save. 71:28 Junior Agogo takes a shot. Comfortable save by Paul Gallacher. 71:01 Paul Hanlon gives away a free kick for an unfair challenge on Ryan Thomson. Free kick taken by Austin McCann. 69:20 Shot by Callum Booth from outside the box goes over the net. 68:04 Andrew Barrowman is caught offside. Graham Stack takes the free kick. 67:17 Corner from the left by-line taken by Martin Scott, save by Paul Gallacher. 66:55 The ball is sent over by Joe Cardle. 65:45 Jason Thomson crosses the ball from the free kick right-footed from right channel, save made by Graham Stack. 65:45 Booking Paul Hanlon is shown a yellow card for unsporting behaviour. 65:39 Andrew Barrowman fouled by Paul Hanlon, the ref awards a free kick. 63:31 Martin Scott gives away a free kick for an unfair challenge on Andy Dowie. Paul Gallacher restarts play with the free kick. 62:08 GOAL - Paul Hanlon:Dunfermline 2 - 2 Hibernian An own goal is conceded by Paul Hanlon. Dunfermline 2-2 Hibernian. 61:16 Joe Cardle takes a shot. Save by Graham Stack. 59:02 Substitution (Hibernian) makes a substitution, with Junior Agogo coming on for Leigh Griffiths. 59:02 Substitution Garry O'Connor leaves the field to be replaced by Akpo Sodje. 59:02 The ball is swung over by David Graham, Close range header by Andrew Barrowman goes wide of the left-hand upright. 58:51 A cross is delivered by Austin McCann. 57:18 Richie Towell takes the direct free kick. 57:18 Substitution (Dunfermline) makes a substitution, with Andrew Barrowman coming on for Andy Kirk. 57:18 Ryan Thomson concedes a free kick for a foul on Isaiah Osbourne. 56:16 Joe Cardle is flagged offside by the assistant referee. Graham Stack takes the direct free kick. 55:41 The assistant referee flags for offside against Garry O'Connor. Jason Thomson takes the direct free kick. 54:25 Free kick awarded for a foul by Isaiah Osbourne on Ryan Thomson. Direct free kick taken by Andy Dowie. Leigh Griffiths gives away a free kick for an unfair challenge on Gary Mason. Gary Mason takes the free kick. 54:04 Volleyed right-footed shot by Isaiah Osbourne. Save by Paul Gallacher. 53:04 Booking Garry O'Connor goes into the book for dissent. 52:07 GOAL - Ryan Thomson:Dunfermline 1 - 2 Hibernian A goal is scored by Ryan Thomson from the edge of the penalty box to the bottom right corner of the goal. Dunfermline 1-2 Hibernian. 50:42 GOAL - Garry O'Connor:Dunfermline 0 - 2 Hibernian Garry O'Connor finds the net with a goal from just outside the box to the top right corner of the goal. Dunfermline 0-2 Hibernian. Correction - 50:30 Booking Garry O'Connor is cautioned. 50:04 Shot from long range by Joe Cardle misses to the right of the goal. 48:29 Garry O'Connor takes a shot. Save made by Paul Gallacher. Floated corner taken right-footed by Martin Scott, Sean O'Hanlon takes a shot. 47:23 Austin McCann crosses the ball, save by Graham Stack. Corner taken by Joe Cardle. 46:27 Shot from just outside the box by Martin Scott goes over the bar. 45:20 Foul by Jason Thomson on Ivan Sproule, free kick awarded. Paul Hanlon takes the direct free kick. 45:00+1:11 It is the end of the first-half. 45:00+0:30 Shot by Ivan Sproule. Austin McCann gets a block in. Outswinging corner taken from the right by-line by Martin Scott, Joe Cardle manages to make a clearance. 41:29 Drilled right-footed shot by Martin Scott. Austin McCann gets a block in. Outswinging corner taken right-footed by Martin Scott from the right by-line, Isaiah Osbourne takes a shot. Clearance made by Austin McCann. Inswinging corner taken right-footed by Martin Scott, clearance by Alex Keddie. 36:21 Garry O'Connor provided the assist for the goal. 36:21 GOAL - Ivan Sproule:Dunfermline 0 - 1 Hibernian Ivan Sproule finds the back of the net with a goal from inside the penalty area to the bottom right corner of the goal. Dunfermline 0-1 Hibernian. 34:03 The assistant referee signals for offside against Andy Kirk. Free kick taken by Graham Stack. 31:01 Unfair challenge on Callum Booth by David Graham results in a free kick. Martin Scott delivers the ball from the free kick right-footed from left by-line, Paul Burns makes a clearance. 29:55 Centre by Austin McCann. 26:10 David Graham has an effort at goal. Blocked by Sean O'Hanlon. Corner from the left by-line taken by Joe Cardle, clearance made by Sean O'Hanlon. Shot by Alex Keddie from deep inside the penalty area misses to the left of the target. 25:27 Garry O'Connor challenges Gary Mason unfairly and gives away a free kick. The free kick is delivered right-footed by Jason Thomson from right wing. 22:58 The ball is sent over by Joe Cardle, clearance by Sean O'Hanlon. Inswinging corner taken right-footed by Joe Cardle from the left by-line, Unfair challenge on Victor Palsson by Alex Keddie results in a free kick. Free kick taken by Graham Stack. 21:08 Inswinging corner taken right-footed by Joe Cardle, clearance by Garry O'Connor. 19:03 Paul Hanlon concedes a free kick for a foul on Andy Kirk. Free kick taken by Gary Mason. Close range effort by Jason Thomson misses to the right of the goal. 18:25 Austin McCann produces a cross. The referee blows for offside against Andy Kirk. Free kick taken by Graham Stack. 16:04 The referee blows for offside against Ivan Sproule. Free kick taken by Paul Gallacher. 13:31 Effort on goal by Leigh Griffiths from 25 yards. Alex Keddie gets a block in. Outswinging corner taken right-footed by Martin Scott from the right by-line, clearance made by Andy Dowie. 12:25 Richie Towell crosses the ball, Andy Dowie makes a clearance. 11:48 Unfair challenge on Martin Scott by Andy Kirk results in a free kick. Direct free kick taken by Sean O'Hanlon. 11:23 Jason Thomson sends in a cross, clearance by Paul Hanlon. 4:33 Corner taken right-footed by Martin Scott to the near post, Andy Dowie makes a clearance. 2:51 Outswinging corner taken by Martin Scott from the right by-line, Garry O'Connor takes a shot. Blocked by Alex Keddie. Effort on goal by Ivan Sproule from deep inside the penalty area misses to the right of the target. 2:11 Andy Kirk concedes a free kick for a foul on Victor Palsson. Free kick crossed right-footed by Richie Towell, clearance made by Austin McCann.